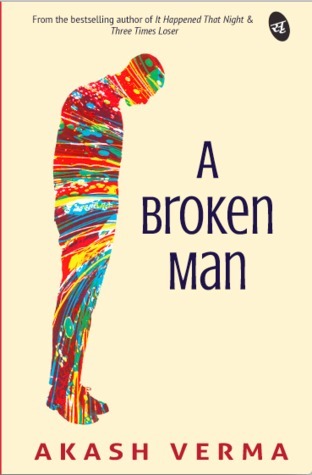 The ordinary figure of "A Broken Man" becomes rather special due to the multitude of colours running in his veins. Just like a rainbow, our life is an ensemble of various hues, each painting a different emotion on the canvas of our heart. A Psychedelic man had me totally impressed! The book begins on a beautiful thought by the Buddhist philosopher Daisaku Ikeda, "As long as one has hope, there is nothing one cannot achieve; everything is born from hope." Beautiful thought to begin a story that feeds on hope. There is something about campus romance that makes stories an instant hit with the readers. Perhaps it is their ability to take us back in time to our college days and envelope us in the warmth of their memories. What makes the story more special is campus romance brewing amidst politics, casteism and issues faced by people in remote villages of our country. A major part of the story runs in flashback, with the rich, popular and successful script writer and lyricist of the Hindi film industry, KK remembering his journey from rags to riches. From a poor Dalit boy who is a nobody in the campus of Lucknow University, Krishna Kumar, alias KK is now the most sought after writer. True to the popular saying "Behind a successful man, there is a woman" KK too attributes his success to Chhavi, his college sweetheart. Though physically not present with him, her memories inspire him each day just like the many inspirational stories she had told him when they were together. The only spark of happiness and hope remained in his life is an yearly email from Chhavi wishing KK on his birthday, the only remaining communication between the two. Like prized possession, KK reads the mails again and again to feel the lot unsaid behind those two words. So one year, when he finds the usual birthday message missing from his mailbox, anxiety and the fear of losing his love grips him. Without thinking twice, he sets out on a road trip from Mumbai to Lucknow - a trip that is also a trip down the memory lane, as he narrates his tragic love story to his driver and confidante, Ram Singh. The story exposes the dark side of casteism in UP and Bihar, as young Dalit student Krishna Kumar has to endure many insults and exploitation due to his lower caste. He leaves his village in remote Bihar for good, hoping for a bright future in Lucknow university. However, to his shock the laws passed by government for equality of all castes is merely a tool used by the politicians on campus. The very leaders who use him as a pawn to play caste politics, inflict caste based insults on him when not in public view. However, his faith in honest politics gets restored by a chance meeting with Chhavi, the daughter of a veteran Brahmin politician. What surprises and impresses Krishna about Chhavi is that despite coming from a popular political family, she has no air about herself. She is committed to serve for student welfare and unlike everyone else doesn't bat an eyelid before befriending a Dalit boy. In no time, Chhavi breezes her way into Krishna's heart and love blossoms. Chhavi not only embraces Krishna for who he is, she also reaches out to his family which has him assured of her true love. Besotted by Chhavi's charm and lost in her love, Krishna forgets the curse of his low caste. It returns to haunt him, this time taking away from him the love of his life. However, before going away, Chhavi ensures to lay the foundation of Krishna's bright future by recommending him to her cousin working with an ace advertising agency in Mumbai. After every few pages, the author pampers the readers to Hindi poetry, something I found very unique about the book. Whether Krishna reclaims his love or not is for the readers to find out. But after reading the book, I felt that the end of the story doesn't matter much in front of the Krishna's journey that keeps us engrossed throughout. If campus politics, romance and social issues interest you, you will find an interesting company in the book on a Sunday afternoon. The awesome Hindi poetry giving guest appearances after every few pages and the street play slogans reminding of JNU. Sheer simplicity of Krishna Kumar. He reminded me of Dhanush from the move "Ranjhana"
As a reader of fiction, I had huge expectations from the ending. When the story finished in a very plain jane manner, I was left looking for more. The ending could have been thought better.